T&T Sweet Tassa founder Lenny Kumar. 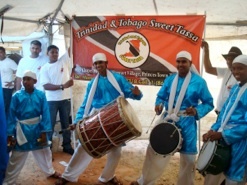 Trinidad & Tobago Sweet Tassa was founded by virtuoso tassaman Lenny Kumar in Princes Town, Trinidad in 2004. Kumar's musical heritage stretches back several generations, from his well-known tassa drumming father Boodoo "Uncle Joe" Singh all the way to drumming ancestors in India. In forming the group, Lenny recruited members from various backgrounds into the band, training them in the art of tassa as a professional discipline. The result is that T&T Sweet Tassa is not your average band, but an organization of professionals who pride themselves not only on excellent musicianship, but also a family-like bond that fosters respect for one another and for the music. 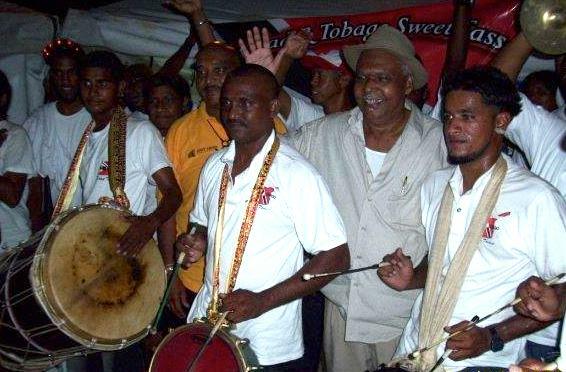 Boodoo Singh with members of T&T Sweet Tassa Senior Band. The organization is currently comprised of four separate ensembles: the Senior Band, Junior Band, and All Girls Band in Trinidad, and the Tampa/Orlando band in Florida. All groups regularly perform for weddings, parties, and cultural events of all kinds. Members have also participated in Hosay drumming in Trinidad, both in St. James and Cedros, have performed in London, Guyana, Antigua, throughout the United States, and in India. Moreover, the group regularly collaborates with high-profile musicians and dancers in Trinidad & Tobago, the United States, and Canada. Some of these include chutney-soca star Rikki Jai, steel pan virtuoso Liam Teague, and percussionist Chris Hanning as well as musical groups like the Montreal Jubilation Choir, Invaders Steel Orchestra, Skiffle Bunch Steel Orchestra, Northern Illinois University Steel Orchestra, and the Percussive Arts Society International Convention Mass Steel Band among many others. The band makes regular appearances in Carnival celebrations in central and south Florida and has been invited to parade with the T&T contingent in Atlanta and Toronto Carnivals in recent years. For several seasons, Lenny Kumar has also organized a display outlining the history of tassa drumming as part of the Carnival Village pavilion in the weeks preceding Carnival in Trinidad. Kumar conducts an educational workshop at Jacobs Fork Middle School in Newton, North Carolina. As part of the organization's mission of promoting tassa and Trinidadian culture in schools, T&T Sweet Tassa has given workshops and masterclasses at a number of universities including the University of Trinidad and Tobago, the University of Florida, Indiana University-Bloomington, and Indiana University Perdue University Indianapolis (IUPUI) among others. Most recently, the band completed a three-day residency at Northern Illinois University culminating in a guest appearance with the NIU Steel Band under the direction of Liam Teague and legendary pan tuner Cliff Alexis. T&T Sweet Tassa has also given educational presentations and performances at the Percussive Arts Society International Convention on two occasions, at the Society for Ethnomusicoloy annual meeting on two occasions, at the West Virginia Day of Percussion, and the Florida Day of Percussion in addition to numerous in-school events. The group has also given cultural presentations hosted by the Caribbean Association of Indianapolis (Indiana) and the Trinidad & Tobago Association of Georgia. T&T Sweet Tassa conducts a workshop at IUPUI. While T&T Sweet Tassa strive for authenticity and depth of knowledge, the organization is also looking to the future. In collaboration with Trinidad & Tobago entrepreneur Digital Business, Ltd., members of T&T Sweet Tassa provided consultation and the sounds of their instruments for the Digital Tassa App for iOS, Android, and Windows mobile devices. With this app, you can play tassa right on your mobile device! Look for a video demonstration on our video page. If you would like to have us perform for your event or provide an educational workshop at your institution, let us know using the Contact Form on our Contact Page. NIU instructor & pioneering pan tuner Cliff Alexis with Lenny Kumar. Members of T&T Sweet Tassa pose with Remo Belli, inventor of the synthetic drum head used on many modern drums, including tassa. Demonstrating the new Digital Tassa App at the History of Tassa display as part of the 2014 Carnival Village in Trinidad.